It seems the Page traffic is not working. It'll be back to normal in a few days, there's a backlog since I stopped some workers after a huge server load spike. It's no longer possible to access this artist entry. Did someone accidentally delete it? Strange -- I looked into the database for dangling artist credits and found 9 which linked to invalid artists. 5 of them were simply people mistyping IDs when updating artist links, so they're fixed now. That leaves 4 credits unaccounted for, and they belong to 2 artists. I'll have to investigate further. Can entries be deleted during database repair? It's possible. I have daily backups so I'll dig up a copy of the database from that time (the 2 affected entries are from mid-March). while it should be "https://vgmdb.net/forums/private.php?do=showpm&pmid=XXXXXX"
I have noticed that on album pages, marking a link as inactive doesn't seem to do anything. I would expect the link to be hidden but it remains visible. Also, since I'm posting in this thread, https links are still unsupported in the credit field for artist profile images. I don't know if it's due to my upload speed nowadays which is pretty fast, but most of my scan uploads are not working well. 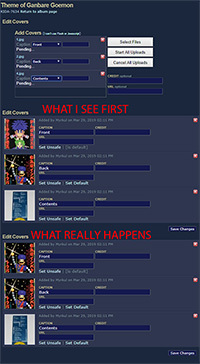 After refreshing the "Edit Covers page", some scans were uploaded twice while keeping the description i entered. It also happened to some contributors... leaving scans sets incomplete because of this. Also improved the code that automatically grabs titles from links, it will still fail in some occasions but it should work a bit better. When uploading scans, the scans stay in a perpetual load state / loading image until you refresh the page. Yeah, it's the same for artist images too. Seems to have started some time in the last month. Her page was linked to a now-deleted unit. The deletion caused a random to be left between the other units. No way to remove it. The unit was also linked to this artist, though it hasn't effected his page yet. Last edited by nextday; Apr 13, 2019 at 10:17 AM.